For the asteroid, see 1717 Arlon. Arlon (French pronunciation: ​[aʁlɔ̃]; Luxembourgish: Arel, pronounced [ˈaːʀəl]; Dutch: Aarlen, pronounced [ˈaːrlə(n)]; German: Arel; Walloon: Årlon) is a Walloon municipality of Belgium located in and capital of the province of Luxembourg. With a population of just over 28,000, it is the smallest provincial capital in Belgium. Arlon is also the capital of its cultural region: the Arelerland (Land of Arlon in Luxemburgish). Before the Roman conquests of Gaul, the territory of Arlon and a vast area to the southeast were settled by the Treveri, a Celtic tribe. The local population adapted relatively easily to Roman culture. The number and quality of sculpted stones and monuments that have been unearthed in the area demonstrate that the vicus of Orolaunum quickly became a vibrant commercial and administrative centre of Roman civilization. The Germanic invasions of the 3rd century destroyed most of these early advances, despite the defensive walls that had been built on the Knipchen hill to protect the vicus. During most of the Middle Ages, the population still used the earlier buildings such as the thermae. In 1060, Waleran I of Limburg, Count of Arlon, built a castle on the Knipchen hill. In the 13th century, the only women's Cistercian abbey known to date was built in Clairefontaine. The Duchy of Luxembourg itself, of which Arlon was dependent, became part of the Burgundian Netherlands under Philip the Good in 1441. After Charles V's abdication of his empire to his son Philip II of Spain in 1556, a troubled period started for the whole region as continuous wars opposed France, Spain, and the Southern Netherlands. In 1558, nearly half of the city, including its castle, was destroyed by the French troops of Duke François of Guise. In the 17th century, Capuchin friars built a convent on the ruins of the castle and the French strengthened the defensive walls according to Vauban's designs. An accidental fire destroyed a large part of the city again in 1785. On 9 June 1793 the French Revolutionary troops opposed the Austrians just outside Arlon. The French emerged victorious and occupied the city. They expelled the Capuchin friars and used their convent as a hospital. After the Battle of Waterloo, Arlon's history is entwined with that of Belgium. Arlon was one of the first victims of the German invasion in 1914 as 121 inhabitants were executed on 26 August, on the orders of Colonel Richard Karl von Tessmar. Its territory was again among the first to be invaded at the onset of World War II. During the war, the mayor of Arlon, Paul Reuter collaborated with the occupying Germans. He was shot in 1946. Being situated very close to the border with the Grand Duchy of Luxembourg, Arlon has continued to expand with new residential areas and commercial development zones, and many people cross the border everyday to work in the Grand Duchy. One of the largest industrial employers is the Ferrero Rocher chocolate factory. All International express trains make a stop in Arlon, as it is the last station on the main Brussels—Luxembourg City railway line. Arlon is best known for holding one of the richest archeological museums in Belgium. It houses numerous examples of Roman sculpture and Merovingian funerary art. A fragment of the Gallo-Roman defensive wall that was built in the 3rd century still stands in Arlon. The Gaspar Museum is well known for its furniture, paintings, ceramics, and religious art. Saint Donat's church now stands on the Knipchen hill, where Waleran I of Limburg once built his castle and the Capuchin friars built their convent. Arlon cemetery has the largest Jewish section of all Walloon cemeteries. A statue commemorating the Atrocities in the Congo Free State of Leopold II is found in the town. The carnival of Arlon takes place at mid-Lent. It includes the traditional handing of the city keys to the carnival prince and a colourful parade composed of various folk dance groups. The Maitrank (German for "drink of May") is the city's most popular refreshment. It is made of white wine in which a local flower, the Asperula odorata, has macerated. Some recipes also add cognac or substitute woodruff for the Asperula. The Maitrank festivities take place in the city every fourth Sunday of May. Wikimedia Commons has media related to Arlon. 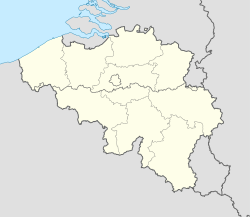 Huy is a municipality of Belgium. It lies in the country's Walloon Region and Province of Liege. Huy lies along the river Meuse, at the mouth of the small river Hoyoux. It is in the sillon industriel, the former industrial backbone of Wallonia, home to about two-thirds of the Walloon population. The Huy municipality includes the sub-municipalities of Ben-Ahin, Neuville-sous-Huy, and Tihange. Marche-en-Famenne is a Walloon municipality located in the Belgian province of Luxembourg. It is the unofficial capital of the Famenne region, sandwiched between the Condroz, former land of the Condrusi, to the north and the Ardennes to the south. Neufchâteau is a Walloon municipality of Belgium located in the province of Luxembourg. Virton is a Walloon municipality located in the Belgian province of Luxembourg. It is also the administrative centre of the district (arrondissement) of the same name, as well as the principal town of the small region of Belgian Lorraine known as the Gaume, famous for its microclimate. The counts of Limburg were the original rulers of the Duchy of Limburg and rose to prominence when one of their house was appointed Duke of Lower Lorraine. Bitburg is a city in Germany, in the state of Rhineland-Palatinate approximately 25 km (16 mi.) northwest of Trier and 50 km (31 mi.) northeast of Luxembourg city. The American Spangdahlem Air Base is nearby. Forêts [fɔ.ʁɛ] was a department of the French First Republic, and later the First French Empire, in present-day Belgium, Luxembourg, and Germany. Its name, meaning 'forests', comes from the Ardennes forests. It was formed on 24 October 1795, after the Southern Netherlands had been annexed by France on 1 October. Before the occupation, the territory was part of the Duchy of Luxembourg and the Duchy of Bouillon. Its capital was Luxembourg City. The Duchy of Limburg or Limbourg was a state of the Holy Roman Empire. Its main territory including the capital Limbourg is today located within the Belgian province of Liège, with a small part in the neighbouring province of Belgian Limburg, within the east of Voeren. Bertrange is a commune and town in south-western Luxembourg. It is located 6.5 km west of Luxembourg City. The Duchy of Luxemburg was a state of the Holy Roman Empire, the ancestral homeland of the noble House of Luxembourg. The House of Luxembourg, now Duke of Limburg, became one of the most important political forces in the 14th century, competing against the House of Habsburg for supremacy in Central Europe. They would be the heirs to the Přemyslid dynasty in the Kingdom of Bohemia, succeeding the Kingdom of Hungary and contributing four Holy Roman Emperors until their own line of male heirs came to an end and the House of Habsburg got the pieces that the two Houses had originally agreed upon in the Treaty of Brünn in 1364. There have been three Partitions of Luxembourg between 1659 and 1839. Together, the three partitions reduced the territory of Luxembourg from 10,700 km2 (4,100 sq mi) to the present-day area of 2,586 km2 (998 sq mi) over a period of 240 years. The remainder forms parts of modern day Belgium, France, and Germany. The County of Luxemburg was a State of the Holy Roman Empire. It arose from medieval Lucilinburhuc Castle in the present-day City of Luxembourg, purchased by Count Siegfried in 963. His descendants of the Ardennes-Verdun dynasty (Wigeriche) began to call themselves Counts of Luxembourg from the 11th century onwards. The House of Luxembourg, a cadet branch of the Dukes of Limburg, became one of the most important political forces of the 14th century, contending with the House of Habsburg for supremacy in Central Europe. Ermesinde I, reigned as Countess of Luxembourg from 1197 until her death in 1247. The Duchy of Bouillon was a duchy comprising Bouillon and adjacent towns and villages in present-day Belgium. It existed from the 10th century until 1795, when, after centuries as a sovereign state, it was annexed by France. It was ruled by the Dukes of Bouillon. The Land of Arlon is the traditionally Luxembourgish-speaking part of Belgian Lorraine, which is now predominantly French-speaking. Arlon is the main city of this region. The remains of the former Abbey of Notre-Dame de Clairefontaine are near Clairefontaine, a Belgian hamlet belonging to the city of Arlon, 3 km from the Luxembourgish town of Eischen.